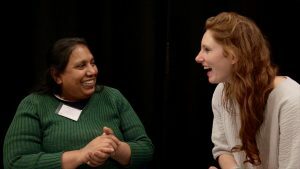 Being involved in the project felt like home – felt like a place where I could take creative risks, where I could experiment with ideas and movements and share thoughts I never thought were relevant to share – and at the same time feel a deep connection with the other participants. The space of the project felt very quickly very safe and I saw that it´s not only me who felt this way. An older participant said after a free dancing exercise: “that´s the first time I´ve danced” and later added: “and felt safe”. How? How was the project scaffolded, so it created such an appreciative and safe atmosphere? 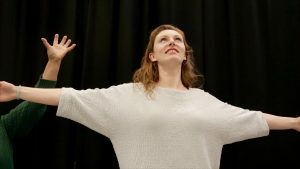 After graduating the Master programme in Applied Theatre at Goldsmith’s and working as a new-born facilitator in mostly movement based workshops I got the opportunity to volunteer for “I live in it”! By reflecting on my own feelings while participating in this exceptional intergenerational project I understood much more about safe spaces than any theoretical text I read could explain to me. The creation of a physical and metaphorical safe space occupies high priority in the field of participatory arts as it is considered ´an important precursor to any collaborative activity.´ The term describes the transformation of a specific location into a space in which participants feel safe to learn new skills and to develop a way to express themselves. That is why I want to reflect on which aspects of the project may have created the safety and freedom of expression. Before every session started in the project space, the group of older participants met an hour earlier in the library of Mulberry School to have tea together. This informal gathering, in which sometimes organisational stuff was getting done but most importantly was the chance to have a conversation outside the project context, developed to a ritual which held the group together. Although the tea time was part of the project, the space had almost no formal rules and the facilitators did not engage with the participants in a specific way. As project roles were suspended, there was no differentiation between facilitators, project managers and participants. In this space everybody was met on a very personal level. This quickened the process of getting familiar with the people and with the relationships between them, which evoked feelings of comfort and safety which extended inside the project space. Another factor I would say created this safe space were the thorough explanations of the tasks and exercises the facilitators asked the participants to engage with. Sue, Ellie and Jamie gave examples from their own lives and disclosed personal stories to make clear what the exercises were about. But their self-disclosure and openness also cultivated an environment that provided congruence. The facilitators were genuinely relating to the participants. They were themselves part of group work where they shared their stories, worked on them creatively and presented them in front of the rest of the group. Also in the project context the line between participants and facilitators was blurred and every story in the room was considered. The facilitators were not only professionals who do their job of facilitating an intergenerational arts project but authentically live the concept. Although the time was short, there was always time for questions and comments. I experienced the facilitators as very empathetic, attentively listening to what happens in (and outside) the room and using this input from the participants to plan the next session. Every small presentation, mostly expressed with movement, was captured and remembered by the facilitators. When the performance piece was assembled, they acknowledged each movement and the owner who had the idea for this movement. This was an extremely powerful moment and I only really got it, when one of my movements were chosen. How proud I was, that something I had developed was chosen to be part of a performance and would be shown in public. Of course, I was and my work was already on stage and shown publicly, but this particular movement of mine which was chosen had another impact on me – it captured a very important moment in my life and was deeply personal. At the same time, nobody in the audience would know that it´s my movement, which freed me of any judgement, so I could enjoy and embrace the movement as such, witnessing the other participants doing it and sharing it with the audience. These few aspects I talked about are not by any means the only ones which created this safe space. But in the end, I think, the most important notion was, that there was no greed for sensation. The workshops were not facilitated in a manner so that the participants were asked to disclose personal stories they were not happy to share. The tasks were about sharing small moments of which everybody could think of and which make all of us unique. At some points, tasks were given, in which every participants had the time to think by herself and later showing the essence of her thinking expressed in a movement or a text. So, not every story we explored in community was verbalised. Nevertheless these stories were present in the body, room and performance. That is why I feel being a part of the ´I live in it´ project was so exceptional. The facilitators attitudes´ towards the participants and their stories illustrates how a relationship may be created so that everybody in the room is able to express their feelings, thoughts and ideas. And this is what matters. Mary Ann Hunter, ‘Cultivating the Art of Safe Space’, Research in Drama Education: The Journal of Applied Theatre and Performance, 13 (2008), p.6.